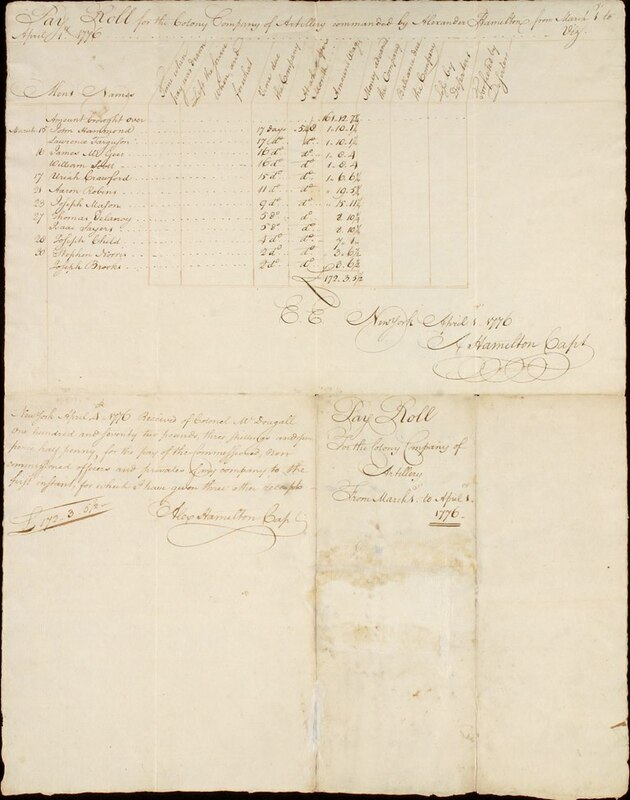 In conjunction with the success of the Broadway musical Hamilton, the Patricia D. Klingenstein Library at the New-York Historical Society is exhibiting a selection of original manuscript documents and contemporary printed works in the library reading room evoking the remarkable life of America’s first Secretary of the Treasury, Alexander Hamilton (1757?-1804). Like a great number of his contemporaries, Hamilton wore many hats; he was an immigrant, scholar, soldier, statesman, and infamously, duelist. Several of these roles are represented in the documents on display. Here’s a taste! 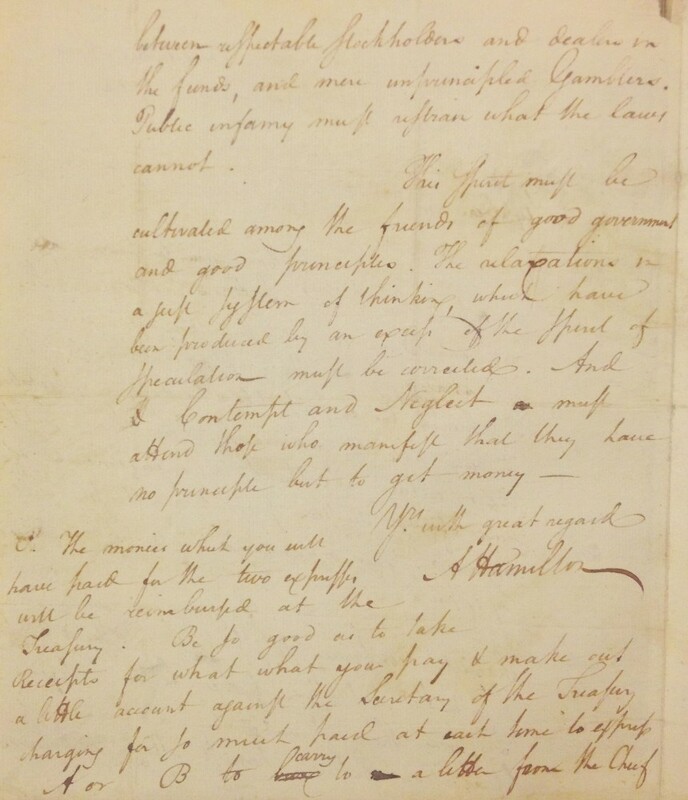 Alexander Hamilton first ventured into the revolutionary fray with his pen while a student at King’s College, publishing two political tracts in response to “A.W. 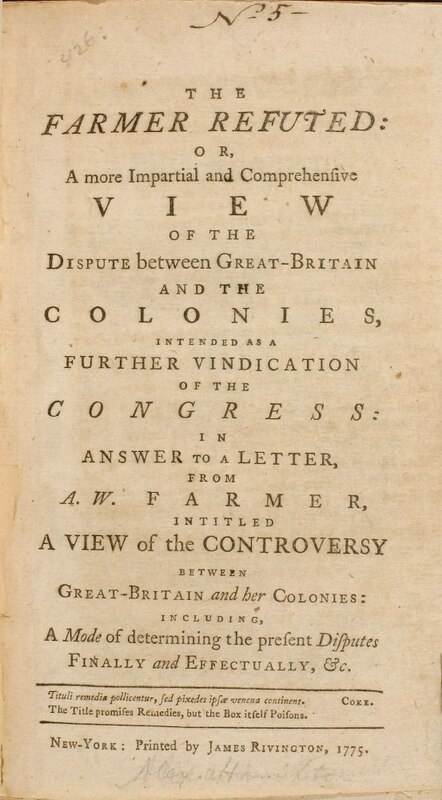 Farmer.” Shown here is his second effort which provides a glimpse of his evolving political philosophy. This copy contains annotations of Thomas Bradbury Chandler, a fiercely loyalist New Jersey clergyman who fled the colonies for England the year of its publication. Fulfilling an ambition to prove himself on the battlefield, Alexander Hamilton commanded an artillery company in the earliest days of the revolution. He would reluctantly leave the field to join George Washington’s staff as an aide-de-camp but Hamilton’s military exploits would prove an important step in his ascent into the ranks of the new nation’s founders. To orchestrate support for a federal constitution Alexander Hamilton, John Jay and James Madison published a series of 85 essays that comprise The Federalist, now regarded as among America’s chief contributions to political thought. The first, by Hamilton, debuted in this issue of the Independent Journal, a semi-weekly New York newspaper. 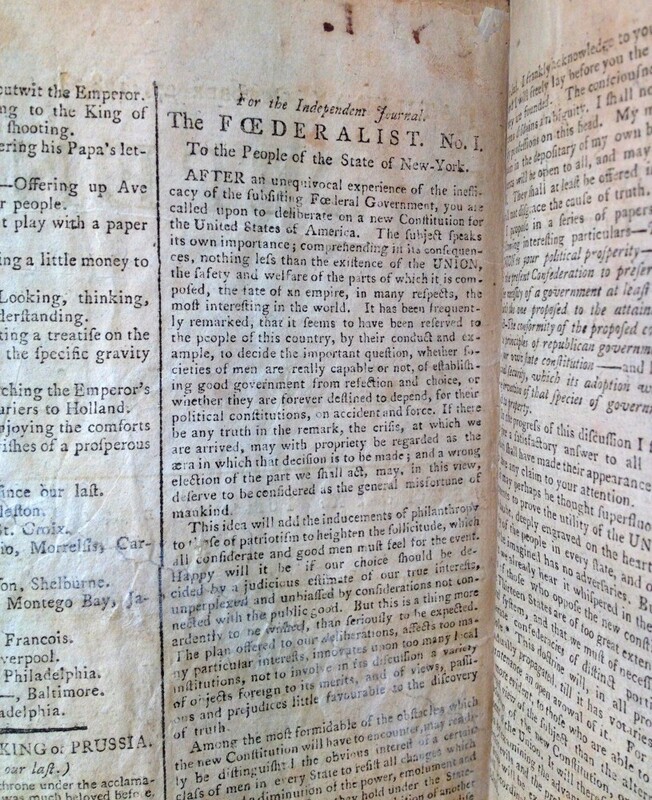 Later essays appeared only in the comprehensive two-volume The Federalist: A Collection of Essays, Written in Favor of the New Constitution, as Agreed Upon by the Federal Convention, September 17, 1787, first published in the spring of 1788. This [public shaming] must be cultivated among the friends of good government and good principles. The relaxations in a safe system of thinking, which have been produced by an excess of the spirit of speculation must be corrected. And contempt and neglect must attend those who manifest that they have no principle but to get money. As secretary of the treasury, Hamilton successfully mitigated the panic’s fallout while helping to build his reputation as architect of the nation’s economic system.